Using your phone often? Tired of turning On and Off? This app turns automatically your screen off when you put your phone into your pocket or onto a table and turn the screen on when you take it out or up. No need to touch any button and you are ready to go. It’s also helpful if you have a broken power button or it’s just hard to press. Use the UNINSTALL button in the app. It monitors the orientation of the device through the gravity sensor. When your phone is pointing downward by its top, below a certain angle, it’s likely to be out of use. In this situation the proximity sensor is activated to determine if it is covered. If yes, it turns the screen off because probably you placed the phone into your pocket or onto a table. 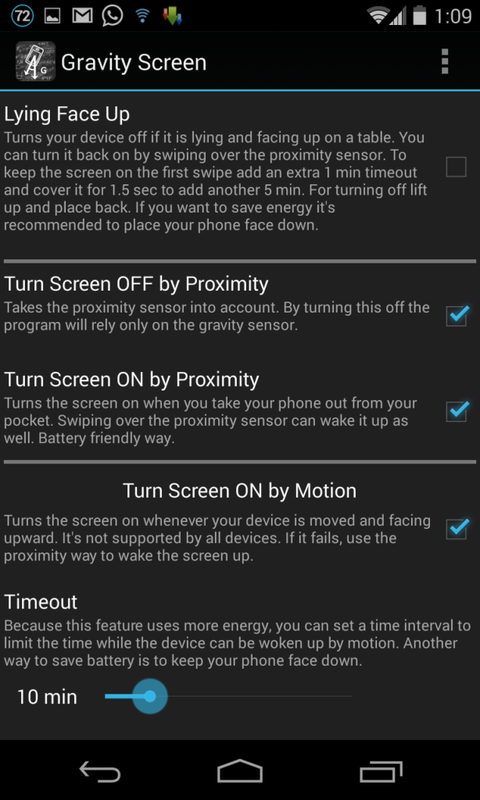 To keep the battery usage low the program turns on the proximity sensor only when it’s really necessary. Moreover, when it turns your screen off and the proximity sensor is covered it puts your phone into deep sleep state to save as much energy as possible. 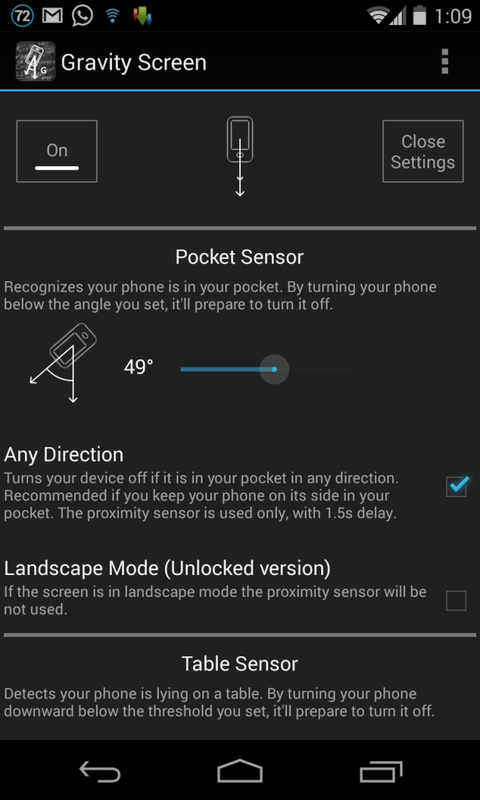 – Pocket Sensor: Recognizes if your phone is in your pocket. – Table Sensor: Detects your phone is lying on a table. – Turn Screen Off by Proximity: activates the proximity sensor before turning the screen off. – Turn Screen On by Motion: If the screen is off and it’s facing up the device can be woken up by any movements, for example by lifting up by hand. – Keep Screen On by Motion: It keeps the screen on by relying on the small movements you are doing by your hand while holding the phone. 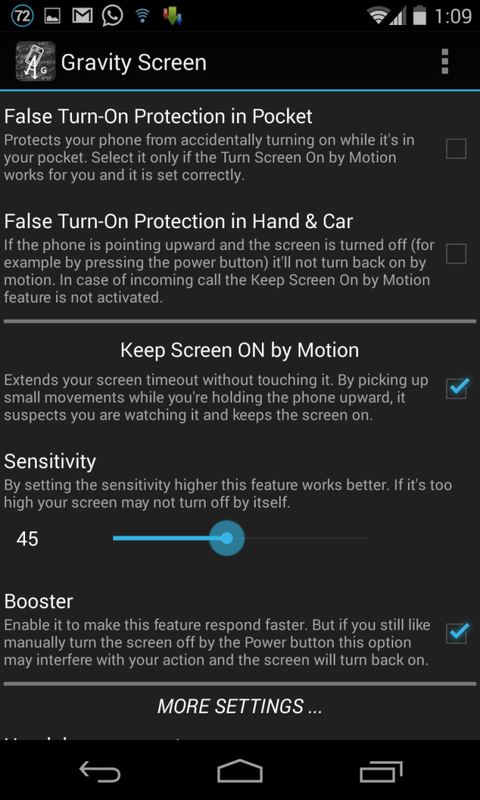 If motions are detected while the screen is facing up, it keeps the screen on because it can be suspected that the phone is held and probably you are reading something. If the phone is steady it will turn the screen off normally no matter the position you leave your device. – Exclude Apps option: The app pauses itself anytime if selected app is running, it’ll resume when you close the app. Useful when playing games etc. – Tasker, Llama, Locale supported by plug-in. In the Pro version, there is no 15 minutes limit for turning the screen on by motion and the Table sensor can be set more precisely. Unlocked version has everything what Pro has, plus it has an Exclude App list, a more advanced Delayed lock option and Widgets. Q: Does not turn the screen always off when I put my phone into my pocket, why? A:The proximity sensor not always accurate. It can fail recognizing some materials specially if they are very close to it. If it happens to you often, you can activate the False Turn-On Protection feature which effectively reduces the number of accidental wake-ups by keeping the screen off even if the proximity sensor fails. Q: I’m experiencing high battery usage, why? A: The app should use about 6 percent extra energy per day if you are not using too much the Turn Screen On by Motion feature, for example keeping your phone face down when it’s on a table. Moreover, the android en-built battery consumption measurement can show much higher results if it’s based on a short period of time.